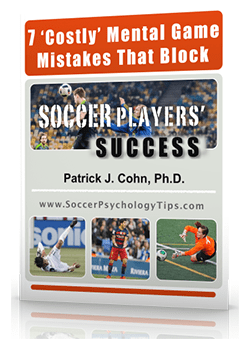 You are here: Home / Soccer Psychology Tips and Strategies / Soccer Psychology Articles / Can Stress Help Players Perform Better? Can Stress Help Players Perform Better? Do You Feel Stressed During Games? Do you feel “stressed” during games? Were you energized by those emotions leading to a good performance or did your emotions overwhelm you and hurt your performance? 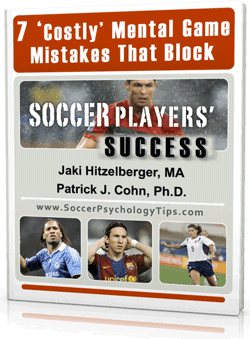 Stress gets a “bad rap” in soccer. 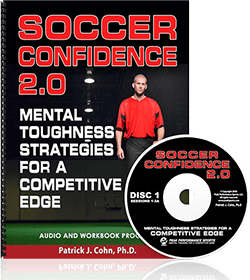 Many soccer players view stress as negative and something to be avoided at all costs but that is not at all the reality of sport performance. Athletic stress is a reaction to a stressor (parents attending a game, your opponents, discomfort, the score, playing with a slight injury or the competition itself). Athletic stress is an emotional and physiological response experienced when an athlete encounters a challenging situation. If you perceive the competitive demands as greater than your ability then your stress response is prolonged, intense and hurts performance. This “negative stress” ruins your performance and enjoyment of soccer. Physiological stress symptoms include: muscle tightness, sweating, “goose bumps,” upset stomach, elevated heart rate, jitters and fatigue. Emotional stress responses include: nervousness, feeling overwhelmed or frustrated, difficulty concentrating, poor decision making, and reduced confidence. Being aware of how you react to stress in games can help you manage the stress response and use it to your advantage. Can stress help soccer players perform? A little bit of stress, also called positive stress can be invigorating and energizing. Small amounts of stress are beneficial for peak performance. Positive stress can ready you for the demands of competition. That’s correct… “Positive stress” is not only beneficial but needed for you to perform optimally. For example, it can heighten your intensity and help you focus your best. Tip #1: You want to focus on “controlling the controllables.” You may not be able to control all stressors inherent in games but you can control your reaction to those circumstances. Tip #3: If your stress hurts your performance in the opening moments of a game and does not go away quickly, it’s probably negative stress based on fear of failure. In this case, you’ll want to contact a mental game coach to help you manage this.